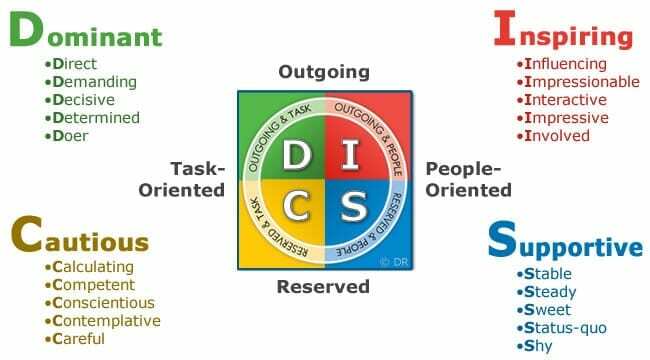 Home What is a DISC Assessment (DISC Test) and DISC Profile? What is a DISC Assessment (Personality Test) ? A DISC assessment is a quick and simple way for you to determine your personality style. You answer a questionnaire where there are no right or wrong answers – just your choices based on how you see yourself. A DISC Assessment is also commonly called a DISC test or a personality test. We do not prefer to call it a personality test, because it is not a pass or fail situation. Again, there are no right or wrong answers – just choices that you make. Our DISC assessments are based on 24 groups of descriptive words that are presented to you to think about and make choices. It only takes about 15 to 20 minutes to complete the assessment. Your online personality assessment is tallied and used to create a personality profile report ( also known as a DISC Profile) that will tell you all about yourself! A DISC profile is a personalized report that is created by our system based on the answers you provided in your DISC assessment. It provides insights about your personal strengths, your preferences in communication and your behavioral traits. DISC profile reports are available that range from concise formats (6-pages) to extended formats of 30-50 pages or more of feedback. Our profiles are carefully designed to be positive and encouraging to help you be your best! “D.I.S.C.” is an acronym or term that was introduced by American psychologist Dr. Willam Marston in the late 1920’s. He developed a personality model based on the ideas of four main behavioral traits that he referred to as Dominance, Influence, Steadiness and Compliance (hence “D.I.S.C.“). That behavioral model gained attraction for practical industrial use in the workplace. DISC has since been used by a number of companies who have since leveraged the concept for use in many areas. The founder of Personality Insights, Inc, Robert A. Rohm, Ph.D, was also intrigued by the DISC concept. He studied DISC and found that, as he began to teach and train others, there was a need to develop better ways to present and explain DISC. He then refined his message and developed what he calls “The DISC Model of Human Behavior” where DISC represents more intuitive primary descriptors: Dominant, Inspiring, Supportive and Cautious. His approach is to be clear to make DISC easy to understand and easy to apply. Here is a basic diagram of The DISC Model of Human Behavior. Stop Guessing and Start Moving Ahead! You may have just enough knowledge of DISC to feel that you can guess your strongest personality trait (for example “I am a D-style”). Be careful, because knowing your strongest personality trait is just the tip of the iceberg! Did you know that each person is a BLEND of ALL FOUR personality traits that can each be measured individually? Your unique personality blend can accurately be measured in only 15-20 minutes with a DISC assessment online. Our assessment system gives you instant access to a customized DISC profile report that will give you deep insights into your personality style along with practical tips on how to leverage your strengths, connect more quickly with others and be more productive. Plus, you will get to see your personality graphs in detail that measure your natural basic personality style (the real you) as well as your adapted environmental personality style that you exhibit in your environment (what others tend to see). Our DISC profiles are different, because they are refreshingly positive. So, you can rest assured that the feedback you receive will be helpful and practical. Feel free to contact us if you have any questions about DISC, DISC assessments or DISC profiles. We will be glad to help you. By the way, if you want to offer your own DISC profiles to your clients or your organization, then we offer a white label custom branded DISC profiles that feature your logo, cover page graphic and contact information. You can even sell your own DISC profiles online with our turn-key solution. Learn more here. Dive Deep … Get Certified in DISC! We offer a full DISC Certification program, including Level 1 Basic DISC Training, Level 2 Advanced DISC Certification Training, Speakers Boot Camp, and Master Level DISC Certification.